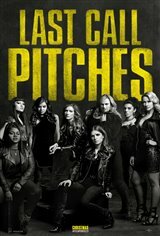 After the highs of winning the World Championships, the Bellas find themselves split apart as they discover there aren't many job prospects for acapella singers. To keep the group together, they jump at the chance to reunite for an overseas USO tour, though they first have to face competition from other performers. Something else also tests their loyalty – when Beca (Anna Kendrick) is singled out to sign with a record label. Will the Bellas be pleased for her success, or will it cause jealousy within the group?